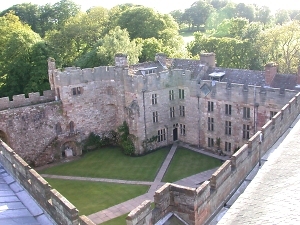 This section covers the birds eye view of a castle showing mainly the walls, towers and keep. There are many drawings which show the true beauty of castle design and the ingenuity of their architects and we plan to include a dedicated drawings section at a future date. As well as circular castles there are triangular castles and ones with satellite towers attached by aerial walkways. The architecture of medieval castles is not complete without looking at how people lived in them. What did they eat? How many people lived in a castle? What were the conditions like? All these areas are influenced by the issues outlined above. Towers (or keeps) are the central part of any defensive castle plans. Often round and hollow they would have living quarters on the upper floors. If they were part of a town wall or an outer ring then the rear of the tower would often be open. The largest tower was probably at Caernarvon castle which was 21m in diameter. Generally castle towers were half this size. A rectangular tower or keep suffered from the dead ground at its angles which effectively became a blind spot in the defences and laid it open to mining as at Rochester castle. Castles in France probably developed solutions to this quicker than anywhere else. The round defences at Houdan (approx. 1110 AD to 1125 AD) being probably the first significant change. Although polygonal keeps were quite rare in France the round tower was adopted much more quickly. Strangely round towers or keeps were developed much later in England. 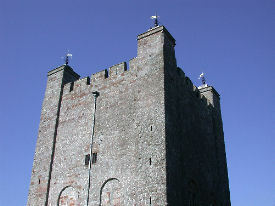 Round towers can be built on square or rectangular bases such as at Cardigan castle. They can also be found on polygonal (usually semi-octagonal) bases such as at Picton (Pembroke).